I only have an hour before I must be down in the village. Can I do something with this? “Only if you promise to remember to go open the gallery on time!” I mutter, as I squeeze the cadmium yellow and red oil paint onto a clean palette. as I looked up into the tangle of trunks. Sweeping curves round above seal-shaped forms below. Light and shadow intertwine in a symphonic melody. Waves and ferry wake are fierce dance partners, bending the spine of the sandstone in its embrace. And now, on the big canvas, I am 25 steps further to the right, closer to sea. I must start again. I must hunch down and grasp all-that-was and all-that-will-be, swing it high over my head then spiral it down, until it is rooted deep into the earth, with confidence, in each brushstroke. But this is yet to come. For now, I must wash the one-inch flat hog hair brush, take off my weathered carmine paint-splattered apron, remove any wild run-away cadmium red or yellow streaks on my face and head to the gallery. Oh but there is more! So much more! What, may I ask, are YOU waiting for? 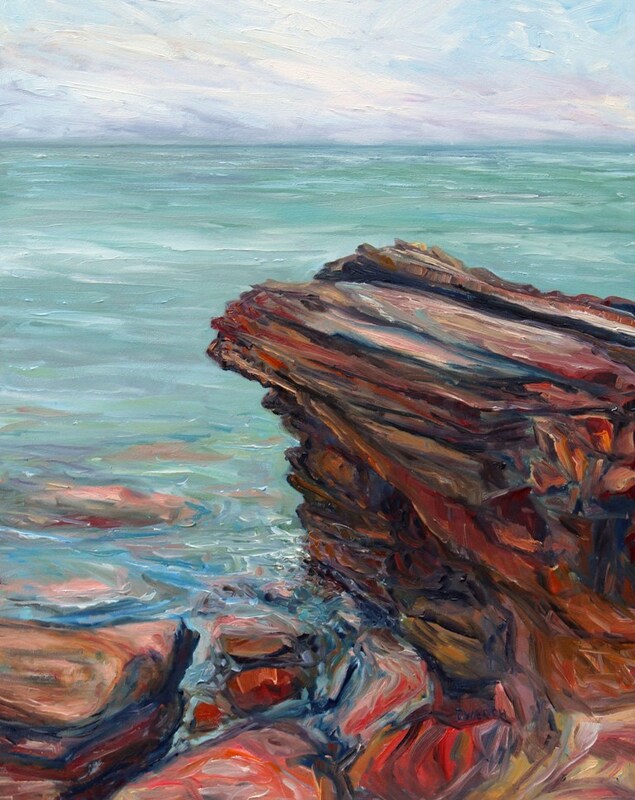 PART 2 “Sea and Shore – Building Up Paint” is now posted HERE. 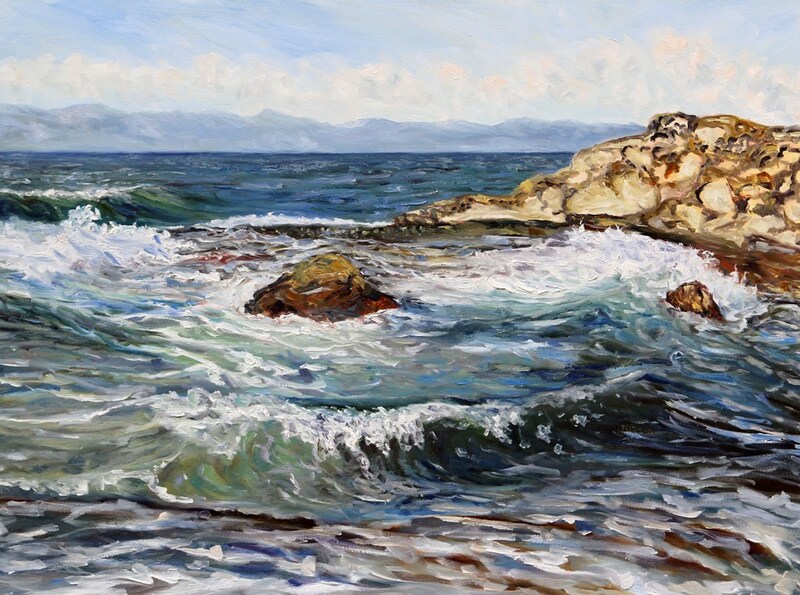 Part 3 “Sea and Shore – Strong Finish” can be viewed HERE. 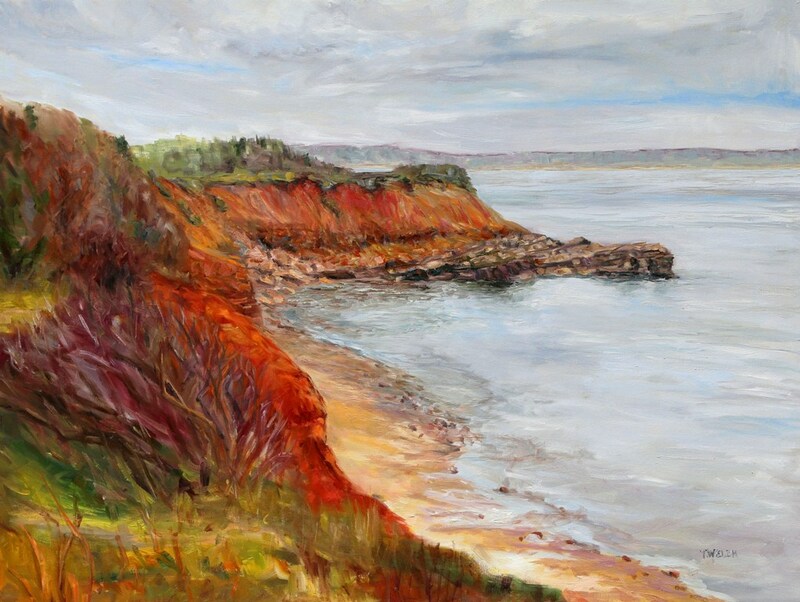 Am I archiving our southwest coast of Canada in my paintings? The very idea has my hands go clammy and a coolness run from tailbone up to the very crown of my head. What a strange assumption I at first thought! But then it came up a couple of more times. But the concept is no longer presented as a question. I am more than a bit squeamish about the idea that my paintings might be considered historical evidence collected to preserve something that no longer exists. I have held higher hopes than this for the influence of these works! I have had no intention of creating historical records with my brush. Instead, I have wanted to create a desire to preserve and protect the land, the sea and our humanity that knowingly or unknowingly rely on them. I want to strengthen our direct relationship and connection with our natural environment, pure and yet not so simple it seems. Have I failed if the paintings, even before I am dead, even before this fragile environment is damaged beyond repair, are being considered as important historical archival documents? As our Canadian federal government agrees to buy an obsolete, yet-to-be-built twinning pipeline from big oil stakeholders for a whopping 4.5 billion of taxpayer dollars while the Provinces and First Nations head for the courts, I am going to go paint! I am going it go paint, not as an act of creating a historical record but as a meditation, an act of mindfulness in appreciation of what is. Therefore, I beg of you – experience these paintings as reminders of what we need to protect rather than coveted records of something that will likely disappear, through oil spills, through climate change, through our collective lack of regard! 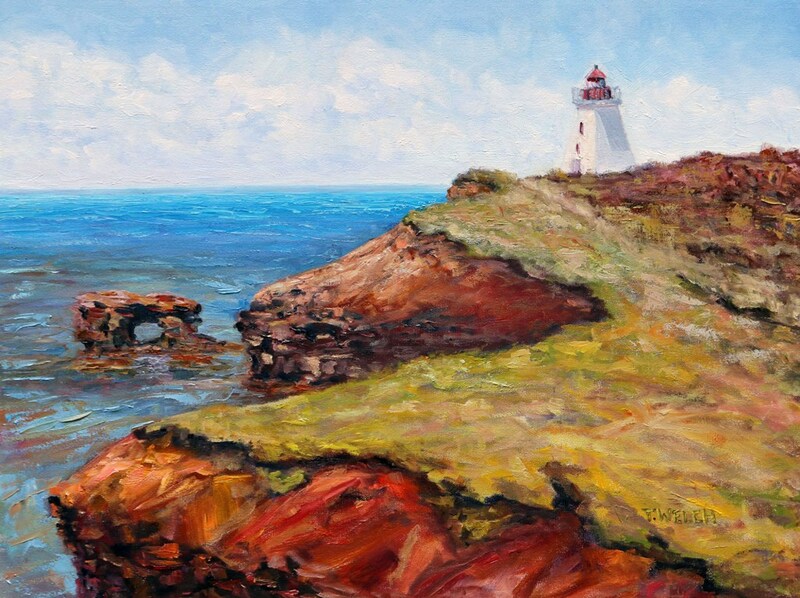 A painting is nothing, absolutely nothing, in comparison to the real thing – in comparison to you experiencing the ordinary moments in an ordinary day somewhere on the southwest coast of Canada. This I am sure of! May the Salish sea breeze ruffle your hair as starfish wink in the low tide, speckled with seagulls, seals, leaping orcas and children playing in the pools of warm water while grandparents watch from under the shade of an old arbutus tree. We can do this hard thing! In this I believe. Summer Art Oil Painting Masterclass To Go! Yes! I am considering piloting my Beauty of Oils Skill Building Masterclass so you can take it with you this summer as an independent online study course. It is all the same great material and more packaged for access anywhere you have an Internet connection. You can work at your own pace, review lessons and do the painting activities as many times as you like… and be invited join a bonus Painters Group monthly live painting problem-solving chat for extra support. Sounds good? Let me know by comment, private message or whatever works for you! If there is enough interest, I will make it happen in the next couple of weeks. UPDATE: You thought “yes” and the independent study class in oil painting is now available. More information is available HERE. Autumn flashes her best colours across our small island during these last few weeks. Now that it is the first of November, I feel I must gather this late season gold together for safe keeping during the winter rains which will surely come soon. There has been a plein air painting day in the Japanese Gardens. There has been a morning walk by sea before an anticipated storm. Best of all though, there has been time to just be and watch the leaves drift down from my favourite maple tree…. Ah yes! October, so many pleasant gifts you have given! What October Gold are you tucking away? In recent years, I have not asked myself to be “out there” on the stage of public life as much as in the past few months. There are oil painting classes to teach in person and online each week. There are new art shows to curate and hang in the gallery every few weeks. There are new paintings to paint, edges to finish, hanging wire to add and get into the inventory to be released. There are paintings that sell and must be packaged and funds deposited using new technology. Here are two recent works off to new homes…. I can now do “SQUARE” with a whole new meaning. In between there are the usual life necessities and yet we still find time for a long lunch after buying art supplies in nearby Sidney. And there are still the daily walks, though often later in the day. Walks with the trees and the sea of course. Then it is back to the gallery the next morning again, refreshed, grounded and ready for another day. What feels complete in your life at the moment? After a summer of chasing the morning light painting en plein air, three students from the Beauty of Oils Painting class and myself are ready for a fall group show in our local Mayne Island Library. Details are in the poster below. The featured painting in the poster is by Jody Waldie. 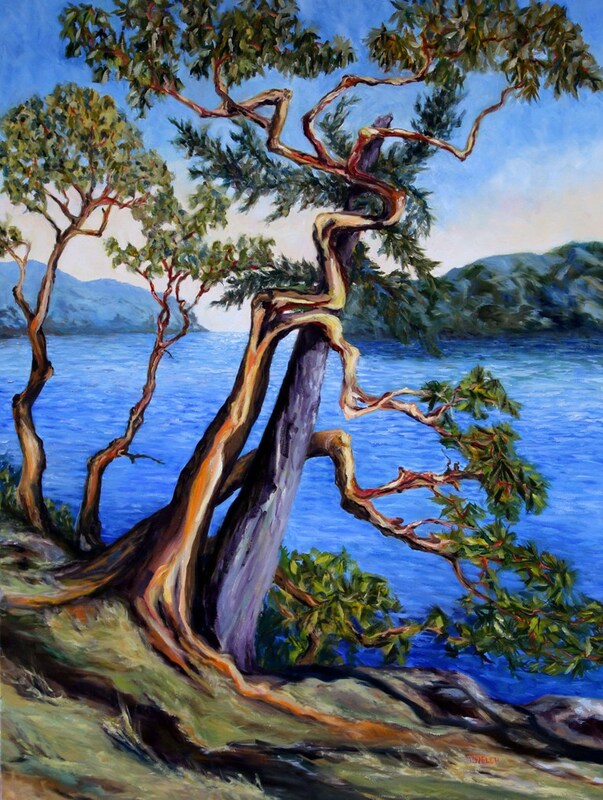 These fellow painters carved out time on most Thursday mornings from May to September to brush in patches of colour on canvas from various vantage points around Mayne Island in British Columbia, Canada. Here are just a few of the paintings that will grace the freshly renovated walls the library for local or visiting viewer’s pleasure. For anyone who has ever attempted painting with oils out in the open air, it goes without saying that we know it takes years of practice and skill-building to render a proficient canvas. Still, from the very beginning, using some basic methods and processes, there is an aliveness, a deep pleasure of the moment, a delight in colour and movement captured on the canvases that is worthy of sharing. I am honoured to have had the opportunity to have provided some of these basics in oil painting lessons and to have been invited to paint side-by-side with these fellow painters as our brushes flew across the canvases capturing our glorious island summer landscapes. There comes a point when nothing can replace regular practice, and more practice. At this juncture a painter has only one reasonable choice – get out there and do it! And we did. I am thrilled to not only having been invited to paint but also to be asked to include a couple of paintings with this group for the fall show. Seeing a selection of our summer’s paintings hung together will warm the chill off the months ahead like winter preserves. How do you like to render your summer joy for winter preserves? P.S. 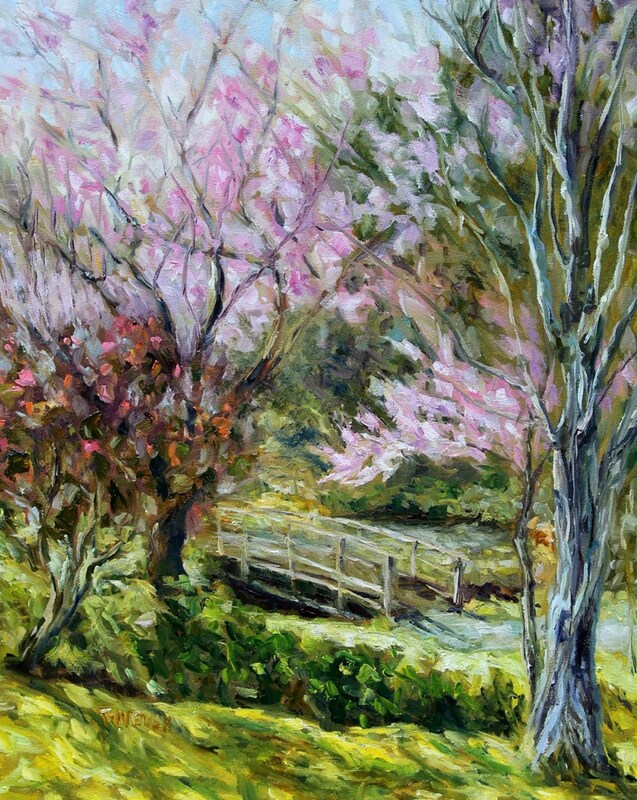 With a bit of luck, we shall have another spring show from the Beauty of Oils Painters at the Mayne Island Community Centre following our winter/spring Studio Intensive oil painting class. The fall class is full with 10 in-person students for the skill building Beauty of Oils painting class and the online sister class is also at its maximum for the pilot class. I do not do much marketing of these classes and it is mostly by word of mouth or if a person happens to catch a Facebook post where I mention the offering. If this is something you think you would like to do either in-person or online you are welcome to let me know via email or messenger on Facebook and I will add your name to the list to be notified of future classes. The weather is fine and a tractor was making the rounds in the field below us yesterday. It was likely the last day for a while because we have entered extreme fire hazard. All day equipment ban in effect Wed. July 26. No spark producing tools. However, I am still inspired to share a few of my summer paintings of farmers’ fields with you, just for fun as we wait for the Terrill Welch Gallery to open on August 4, 2017. No heavy equipment or spark producing tools were used in the making of these paintings or in posting them for your viewing today. 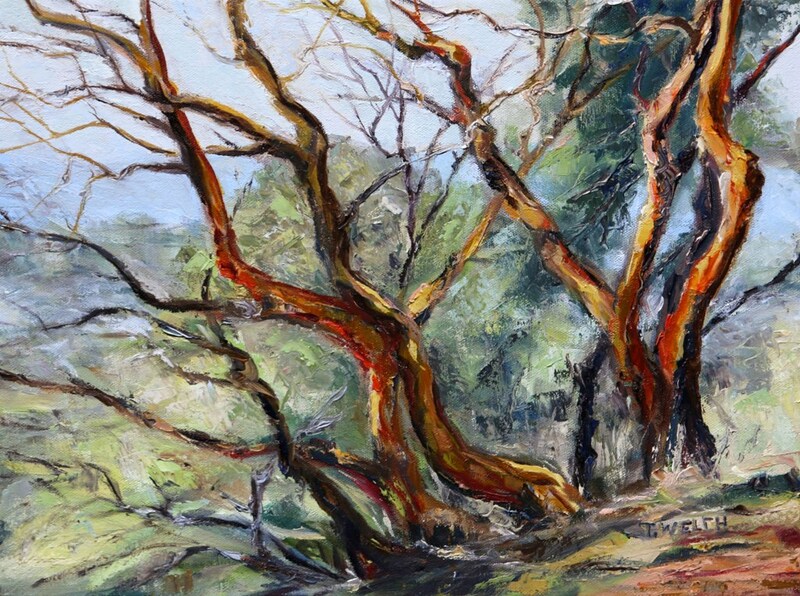 Haying time signifies summer and this impressionist style painting holds the desire for coolness in the deep shade of the big tree. This is one of the Deacon Vale Farm fields on Mayne Island in B.C. where I was doing a photo shoot of the harvest and later completed this work in the studio. An ever-changing view with eagles and turkey vultures often at eye level as they glide by – fields and hills changing with the season and the passing of each hour. This is the Meadowmist Farm field below us on Mayne Island and it was painted plein air from our outside deck. This painting was completed in two plein air painting sessions on my parents’ farm outside of Vanderhoof B.C. I have painted other summer fields but these are three of my favourites. Do you have a favourite farmer’s field near you? Try as I might, the mix of experiences this past week refuse to be organized into a meaningful story. It all feels like beautiful colours tangled into a day with no breaks in the string, no long pauses and no rest points. New projects, such as getting a gallery up and running, are often like this I think. The past seven days went something like the late ferry sunset building to a perfect moment. As the sun drips into the sea, we turn away preparing for night and see the almost-full moon reaching out to greet us. In this flow of melded time, knowing one of these moments, someday, will be our last, one is often tempted to think about the strange concept of forever. What moments this past week have tempted you to think about forever?